It takes a certain kind of comic genius to create a character who is, to quote the classic Sondheim lyric, appealing and appalling. But be forewarned: Borat is not "something for everyone." It arrives as advertised as one of the most outrageous, most offensive, and funniest films in years. 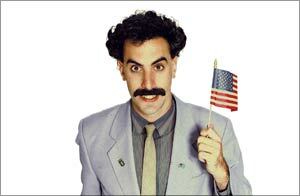 Kazakhstan journalist Borat Sagdiyev (Sacha Baron Cohen reprising the popular character from his Da Ali G Show), leaves his humble village to come to "U.S. of A" to film a documentary. After catching an episode of Baywatch in his New York hotel room, he impulsively scuttles his plans and, accompanied by his fat, hirsute producer (Hardy to his Laurel), proceeds to California to pursue the object of his obsession, Pamela Anderson. Borat is not about how he finds America; it's about how America finds him in a series of increasingly cringe-worthy scenes. 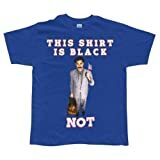 Borat, with his '70s mustache, well-worn grey suit, and outrageously backwards attitudes (especially where Jews are concerned) interacts with a cross-section of the populace, catching them, a la Alan Funt on Candid Camera, in the act of being themselves. Early on, an unwitting humor coach advises Borat about various types of jokes. Borat asks if his brother's retardation is a ripe subject for comedy. The coach patiently replies, "That would not be funny in America." NOT! 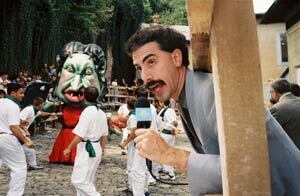 Borat is subversively, bracingly funny. When it comes to exploring uncharted territory of what is and is not appropriate or politically correct, Borat knows no boundaries, as when he brings a fancy dinner with the southern gentry to a halt after returning from the bathroom with a bag of his feces ("The cultural differences are vast," his hostess graciously/patronizingly offers), or turns cheers to boos at! 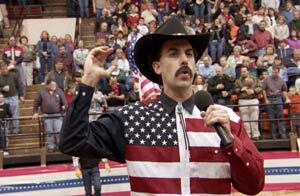 a rodeo when he calls for bloodlust against the Iraqis and mangles "The Star Spangled Banner."